Controversial welterweight Nick Diaz (Pictured) was in the throw-people-under-the-bus kind of mood today. After appearing 45 minutes late to Wednesday’s UFC 137 conference call, Diaz claimed he was never notified by the company about the media gathering. Although the press received notification on Monday regarding today’s powwow, and another reminder early this morning, Diaz states the UFC’s PR department failed to give him the heads up. Diaz was originally slated to challenge champion Georges St-Pierre for his crown in the card’s featured contest, but he was yanked from the bout after ditching back-to-back press conferences to promote the pay-per-view broadcast. Given his recent track record, many were questioning the I-did-not-know excuse Diaz pulled today. Speaking of the two “beauty pageants” the 28-year-old skipped, Diaz did express great remorse for what had transpired. However, he wasn’t quite prepared to accept full responsibility for everything that went down. “Of course I have regret,” he emphatically stated. “I have people supposed to take care of stuff. I’ve got like a lawyer, or something, that’s supposed to get paid like 100 grand, or I don’t know, a ridiculous amount of money. “I’ve been doing the same, living the same, since I started – since I was 17. I live down the street from my parents, who I used to live in the same house with. Now I live with my brother, and I’ve got all these people, business people and big money people around me trying to make deals. I don’t know anything about that. 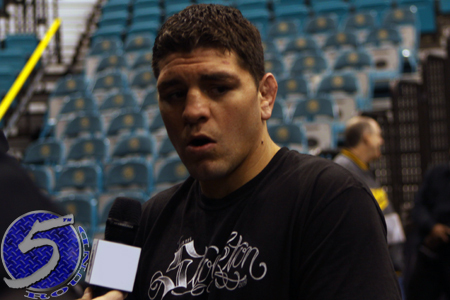 Diaz headlines UFC 137 opposite BJ Penn. Their 170-pound affair takes place October 29th inside the Mandalay Bay Events Center in Las Vegas, Nevada. It is believed Diaz has highlighted this date on his calendar.